On the 15th of January we asked people in Louth about their opinions on fracking. I thought it would be interesting to contrast this with the way people feel about wind energy, particularly since planning applications for new turbines continue to attract opposition. Is this a case of a few people who will be directly affected making a lot of noise, or does it reflect a more general disaffection? 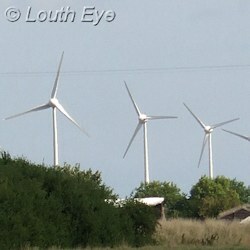 Are you in favour of more wind turbines in Lincolnshire? With 42% coming out in favour of wind energy versus 38% against it, the results seem to be too close to call. What is interesting is that far more people seem to have made up their minds on this issue, compared with fracking. Only 12% of people said they didn't know, whilst 8% were on the fence with a "maybe". In Lincolnshire we've had a lot longer to get used to turbines, and to learn about the pros and cons of this technology. The question we asked didn't specify onshore turbines, although it probably should have since this is what most people think of in terms of wind power. But there is a difference between the way people feel about turbines out at sea, and how they feel about having them on their doorstep. Mostly people mentioned being happier to have them out at sea, but this wasn't universal and it deserves a poll of its own. Given the somewhat negative feelings of Lincolnshire residents towards fracking, I expected slightly more people to be in favour of wind energy. Indeed, a couple of people made statements to the effect that they would rather have wind turbines than fracking. However, a lot of people have not yet made up their minds on that issue, and when awareness grows of the issues involved in shale gas extraction, I expect it will have an impact on opinions about other energy sources.